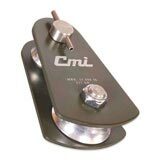 New from CMI this arborist block with zinc-plated steel sideplates will handle up to 3/4" lines on a 2-3/4" aluminum sheave. The sheave rides on bushings around a stainless steel axle. Min breaking strength: 25,000 lbs.